(CNN) -- Spain's defense of their Davis Cup title has been delayed after strong winds forced the opening day of their first round showdown against Serbia in Benidorm to be cancelled. 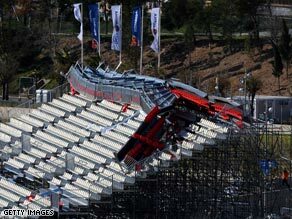 Damage to one of the stands caused the postponement of the two opening singles rubbers in Benidorm. David Ferrer was due to face world number three Novak Djokovic in the opening singles rubber, with the second match on court a clash between world No.1 Rafael Nadal taking on Janko Tipsarevic. But high overnight winds saw some seats ripped out in the 16,000-capacity stadium, causing some concerns over its structure. Organizers initially delayed the start of play before announcing that the two matches would be held over until Saturday. However, no decision has yet been made as to whether the doubles rubber will remain on Saturday as well, or pushed back to Sunday. Elsewhere, France and the Czech Republic are level in Ostrava after Tomas Berdych beat Gilles Simon 7-6 4-6 7-6 6-3 to put the hosts ahead. However, Jo-Wilfried Tsonga levelled matters with a 7-5 6-2 7-6 win over Radek Stepanek. Croatia, the 2005 champions, look set to reach the quarterfinal after opening-up a 2-0 lead over Chile in Porec. Mario Ancic defeated Nicolas Massu 6-3 6-3 7-6 in the opening rubber before Marin Cilic trounced Paul Capdeville 6-1 6-2 6-1 to leave the home side one win away from the last eight. Russia also look set to reach the last eight after moving 2-0 ahead of hosts Romania in Bucharest. Marat Safin beat Victor Crivoi 7-6 6-4 6-4 in the opening rubber while Mikhail Youzhny made it 2-0 with a 6-4 6-2 6-4 victory over Victor Hanescu. Last year's beaten finalists Argentina also have one foot in the last eight after taking a 2-0 lead over the Netherlands in Buenos Aires. Juan Ignacio Chela put the hosts ahead with a hard-fought 6-2 2-6 6-2 6-7 6-2 victory over Jesse Huta Galung. Juan Monaco doubled their advantage with a more comfortable 6-1 6-2 7-6 success over Thiemo De Bakker.